We refreshed website of Dakea — brand of Danish manufacturer of roof windows which operates on several European markets. 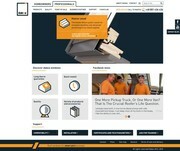 Redevelopment of this website was vary challenging project. It required the preparation of two extended variants of web page: for professionals (roofers) and house owners, in 10 different language versions. Navigation had to be improved. Published content had to be reorganized. Page layout was supposed to be more intuitive and at the same time universal — appropriate for users from different European markets. All components of the webpage, created earlier in Adobe Flash technology, were redesigned and recreated with the use of HTML. Page gained visual attractiveness, convenient side navigation and legible icons. Both roofers and house owners are now able to easily find needed information. Special search engine combined with graphically personalised Google Maps allows users to find nearest retailers of Dakea or information about subcontractors.